My first fashion presentation of the season was Kaelen. They presented a cohesive collection of clothing for the woman who is chic and stylish but doesn’t want to spend a ton of time getting dressed. The colors used were black, white, tan and yellow. This led to a mellow collection that didn’t compete for attention with color. 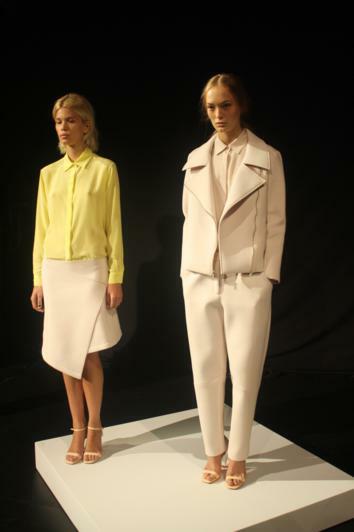 Structural separates dominated the collection. Shoulders were sharp and edges were clean. I loved how seamlessly the clothing seemed to glide over the body. The fabric looks impossible to crease. Yellow was used sparingly, like for this long-sleeved shirt-dress. I love the accent shoulders. They seem to be around to stay, for the woman who wants a strong look. This yellow is so dreamy. Most of the hemlines were at a demure knee-length. The gowns, though, were something special. For the woman who is tall and slim, these play with length and are flattering in a simple, chic manner. 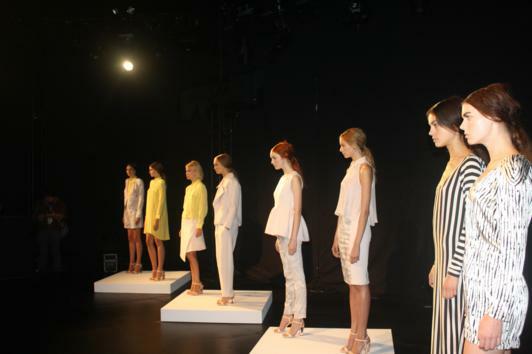 I loved the Spring/ Summer Collection from Kaelen. It reeked of New York’s signature effortless glamour.